Third in a series by Anne W. Anderson (the other half of we), who visited with each of the studio owners hosting the 2014 Tampa Bay Tour de Clay, a self-directed series of stops stretching from Palm Harbor to San Antonio. 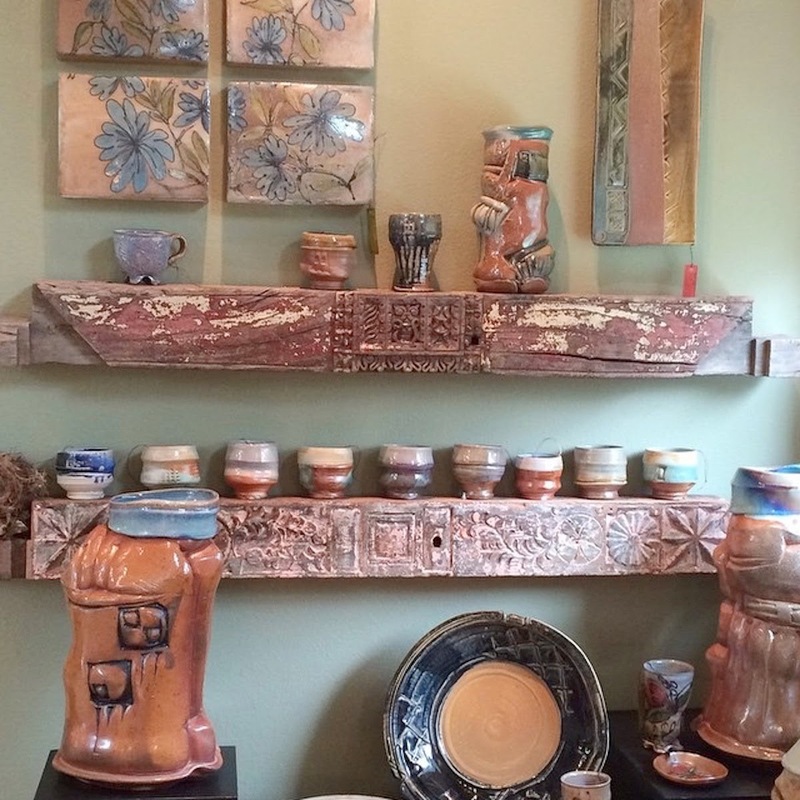 For Kim Kirchman and Mark Fehl, owners of Hidden Lake Pottery, pottery isn’t just a way of making a living. It’s a way of wedging together pieces from their childhoods, their academic studies and travels, the rituals of friendships and family life—plus their sensibilities to movement and space—and, from those pieces, shaping a life. That life is reflected in their daily routine. of the ceramics and wood studios at St.Petersburg College’s Clearwater campus, and Fehl, an art teacher at Tampa’s Northwest Elementary School, get their children off to school, then head in opposite directions. They spend their days helping people of all ages find artistry within their own lives. Then Kirchman and Fehl return to their Odessa home, which is tucked back off of a quiet road not far from Gunn Highway. Behind their home is Hidden Lake, secluded by a stand of cypress and other vegetation. In front is the airy studio they designed and for which Kirchman built all the cabinets, shelving, and worktables. The tall glass windows in their studio look out over a wooded area lush with trees and brush and critters. “We’re in a rural pocket here,” said Kirchman, a fourth-generation Floridian whose father was born and raised in the Everglades. Kirchman, raised in DeLand, recalls “marathon fishing and camping trips” in the Ten Thousand Island area of southwest Florida. Fehl, too, recalls being a “kid with a cane pole catching bream and sunfish” from ponds in the then-wooded areas surrounding Clearwater. Born in Michigan, Fehl came here as a child, attending an un-air-conditioned Plumb Elementary, Oak Grove Middle, and Clearwater High. The two met in the University of South Florida’s clay studio—both originally were interested in drawing, painting, and other arts but found a home in the earthiness of clay. Fehl became the director of what was then the Centre Studios in the USF student union. 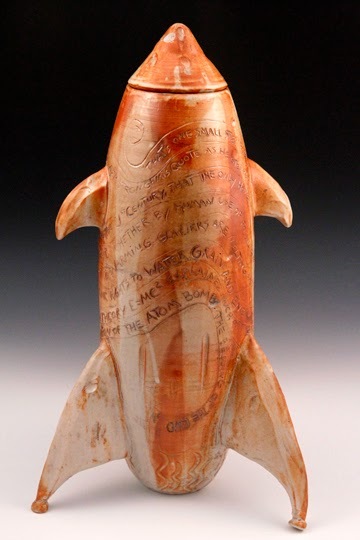 Along the way, Fehl worked with Ed Ross, the artistic founder of Community Stepping Stones, a non-profit organization facilitating community art projects in the Sulphur Springs area, and he and Kirchman were studio mates with Richard Beckman, who was until his 2004 death a leading Florida sculptor and USF professor. When Kirchman returned to USF for an MFA, Beckman was her mentor. Their extended academic experiences shaped their outlook on the artistic life. Their art has become as much, maybe more, about the process as about the product. In the studio, their community is each other and, in a way, the clay and the space itself. Kirchman, for instance, almost totally hand-builds her pieces. She works with slabs of clay, shaping them into functional items such as serving dishes. Then Kirchman paints, using glazes, intricate floral and other designs onto strips of newsprint. After they dry a bit, she presses the newsprint onto the unfired dish. Then she carefully peels the paper away, leaving the glazed design behind. 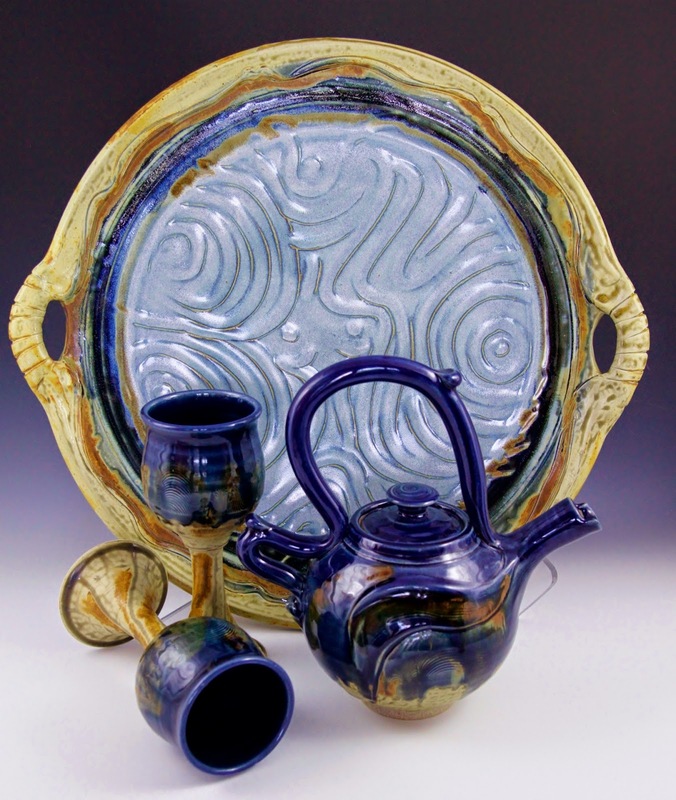 For other pieces, Kirchman winds coils of clay atop each other, then blends them together to create jars or other vessels. of a larger historical and artistic context. Gestures of the potter’s hands create a sense of movement in the clay. One huge jar seems alive with the organic swirling of water, the swells and eddies revealing, then concealing, glimpses of what could be biomorphic plants and ferns. Both processes require not just movement in the clay, but a choreography of sorts in the studio as Kirchman shifts from slab roller to table to drying area back to table and so on. “I become very aware of how I am moving through the space of the studio,” Kirchman said. For Fehl, who uses a manual foot-controlled wheel, the awareness is even more localized to “the ebb and flow” of his own body. “It slows down movement and ties you into a more primal point,” said Fehl. Fehl’s work begins with symmetrically thrown bowls. Then Fehl distorts, expands, and layers the pieces, looking for a balance within the asymmetry and drawing on memories of shapes and designs acquired over the years. Kirchman points out window-like designs in some of Fehl’s pieces. tableware would be right at home in Wonderland! “Those were influenced by actual windows on ancient castles and forts we saw in Japan,” said Kirchman, who led a group of college students on a month-long tour of Japanese traditional kiln sites, studios, and museums. 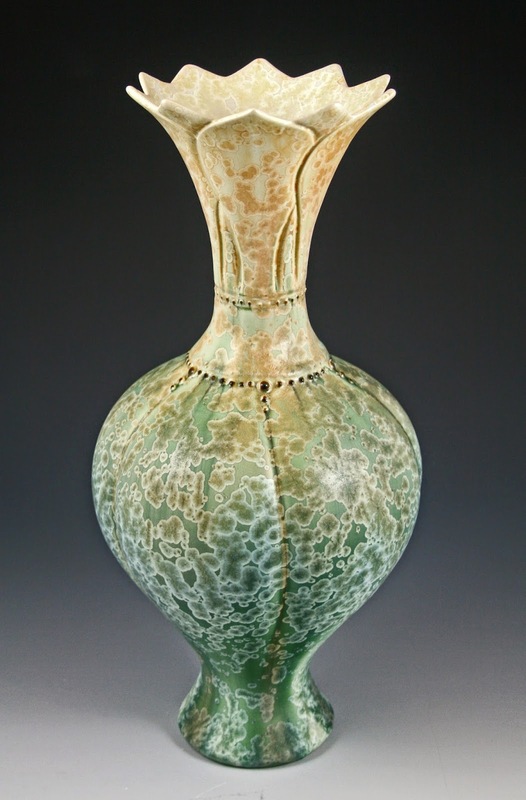 Kirchman also has visited Korea, a country whose pottery history pre-dates that of Japan. Outside the studio stands a massive wood-fired kiln, inspired by the Japanese kilns and built by Kirchman and Fehl with the help of a larger community of clay friends. “That’s 40,000 pounds of dry-standing bricks,” Kirchman said, recalling the physical labor. Four times a year, they load the kiln and light the fire. Friends help feed about a cord of wood into the flames starting about 4 a.m. and ending about 10 p.m. They monitor the temperature constantly until it reaches 2400 degrees. Then the kiln takes a week to cool before it can be opened. “That’s when we find out if it was a success or a disaster,” said Fehl. Visitors on Tour day will see the open kiln with some work left inside and can ask questions about the process. Tour-goers following the south-to-north route will find Hidden Lake Pottery studio listed as the third stop. Guest artists Chuck McGee, LCMcGee, Kimberli Cummings, McKenzie Smith, Jonathan Barnes, and Trevor Dunn will display their work throughout the shop. one of the host studios on the 2014 Tampa Bay Tour de Clay. First in a series by Anne W. Anderson (the other half of we), who visited with each of the studio owners hosting the 2014 Tampa Bay Tour de Clay, a self-directed series of stops stretching from Palm Harbor to San Antonio. Fifteen or so years ago, Glenn Woods had won awards for crafting words and images into newspaper, radio, and television ads and was working as a marketing research analyst. He hated it. 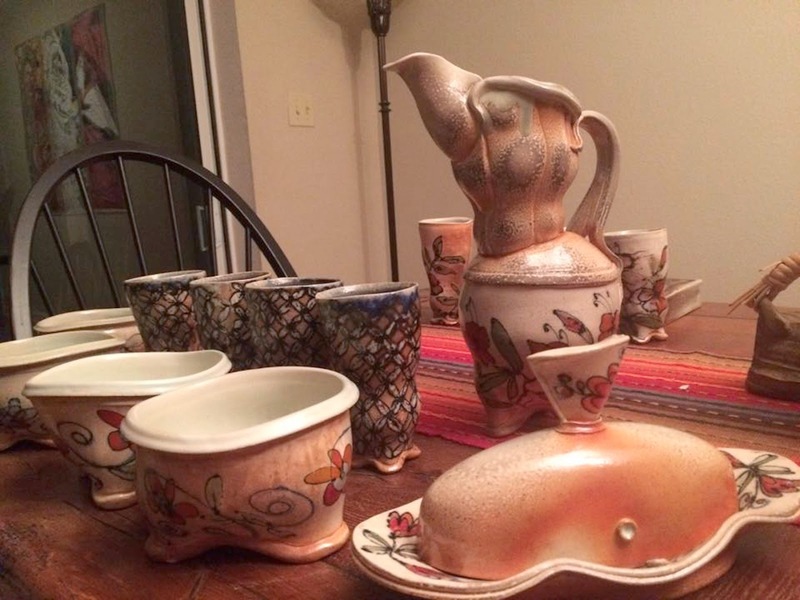 What he loved was taking lumps of clay and crafting them into beautiful platters, vases, trays, and teapots, a passion he had been nurturing since high school. Fifteen or so years ago, Keith Herbrand was in the retail grocery business. It paid the bills, but Herbrand and Woods, then living in the Midwest, were working up the courage to trade their traditional jobs for the riskier business of being full-time ceramic artists. 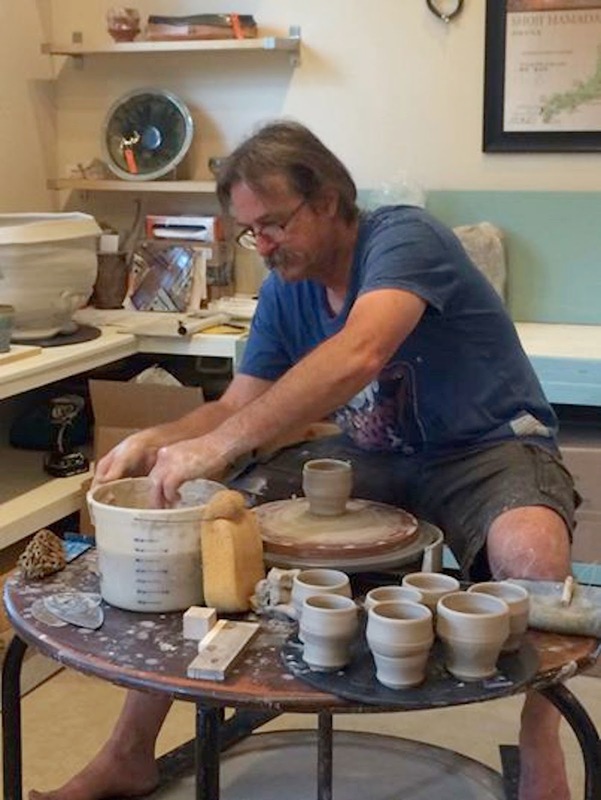 “We found a wholesale ceramics business, with a home and studio, for sale in Palm Harbor,” Woods said. 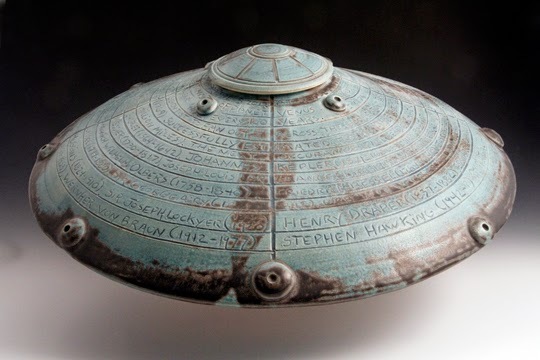 The Pottery Boys, as Woods and Herbrand named their business, spent the first year filling orders contracted by the previous owner. “Widgets,” Herbrand termed them. They soon realized widgets weren’t their passion. Today, Woods’ pieces seem rooted in the twilight world between reality and dreamland. Vases with rounded bowls grow upward, leading to hand-carved, petal-like openings—as though the vase, unwilling to wait for cut flowers, became one itself. Graceful teapots with curved handles and spouts feature sculpted vines and leaves sprouting from the lid. The gnarled, twisted stems of gourds and melons contrast with smooth-skinned, ribbed bodies. The shapes hearken back to Woods’ childhood, spent roaming the woods and exploring rural life surrounding the small northern Indiana town of Middlebury. 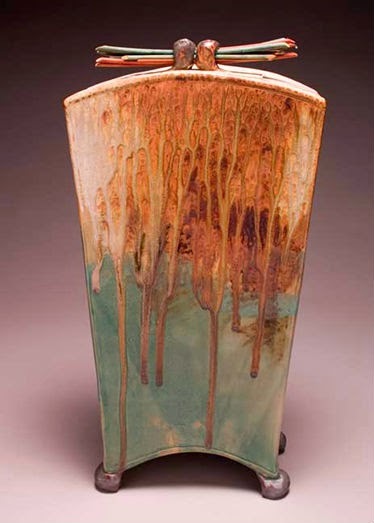 But the glazes, especially on Woods’ more recent work, add an ethereal dimension of their own. “We’ve been experimenting with crystalline glazes for the last eight years and matte crystalline glazes for the past two years,” Woods said. Crystalline glazes contain zinc and silica suspended in the mixture. When the glazed piece reaches melting temperature, the zinc and silica flow together, bond and form crystals during the cooling process. 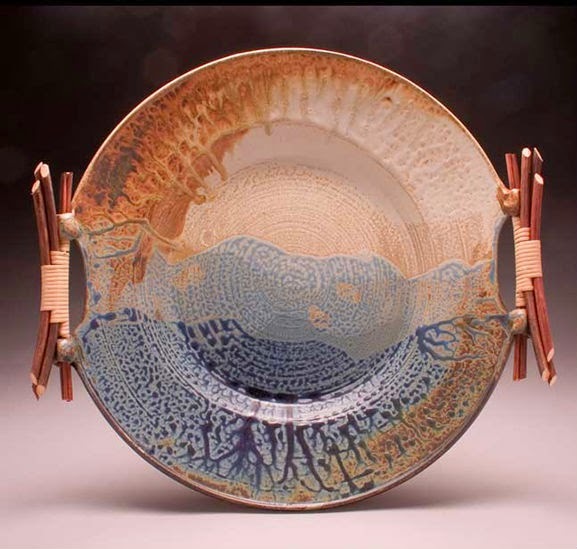 Artists raise and lower the kiln temperatures to control the rate at which the glaze flows, the rate at which the crystals grow, and to influence the color, texture, and size of the crystals. When the pieces cool, the flower- or star-shaped crystals look as though they are floating in mid-burst over the colored surface, creating a sense of explosive exuberance. Woods doesn’t hesitate when asked who influenced his journey into pottery. That art teacher did more than introduce Woods to clay and other materials. “I had struggled with learning problems, which lead to placement in “special education” status from third to about sixth grade. The “slow learners” were basically placed off to the side and not really expected to participate in the learning process,” Woods said. Despite his difficulties with the academic courses for so many years, Woods found art leading him back into and helping him to understand those other subjects. His high school art teacher helped him use math to learn how to mix glazes, how to use language to express his artistic ideas, and how to see the science in the art. Eventually, with his teacher’s guidance and encouragement, Woods won a scholarship competition and entered the University of Indianapolis. bases gracefully moving with the music. Because Woods hadn’t taken a foreign language in high school, he was faced with taking up to three years of a foreign language in college to earn a fine arts degree. 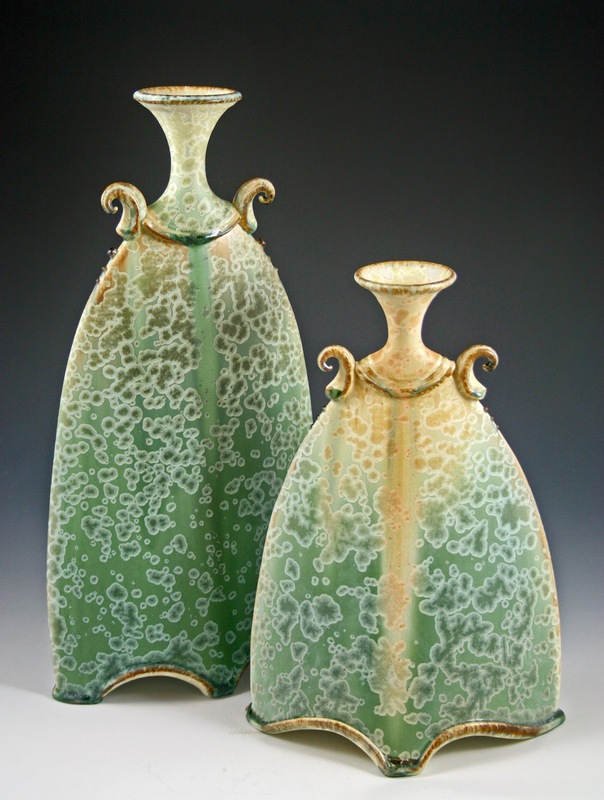 Instead, Woods earned a Bachelor of Science in Arts with a concentration in clay. At his exit interview, though, Woods recommended allowing ASL as a foreign language to help students with no exposure to foreign languages earn a Bachelor of Fine Arts degree—the foreign language requirement being the only difference between the two degrees. “I also suggested all art majors take an introduction to business course,” Woods said. 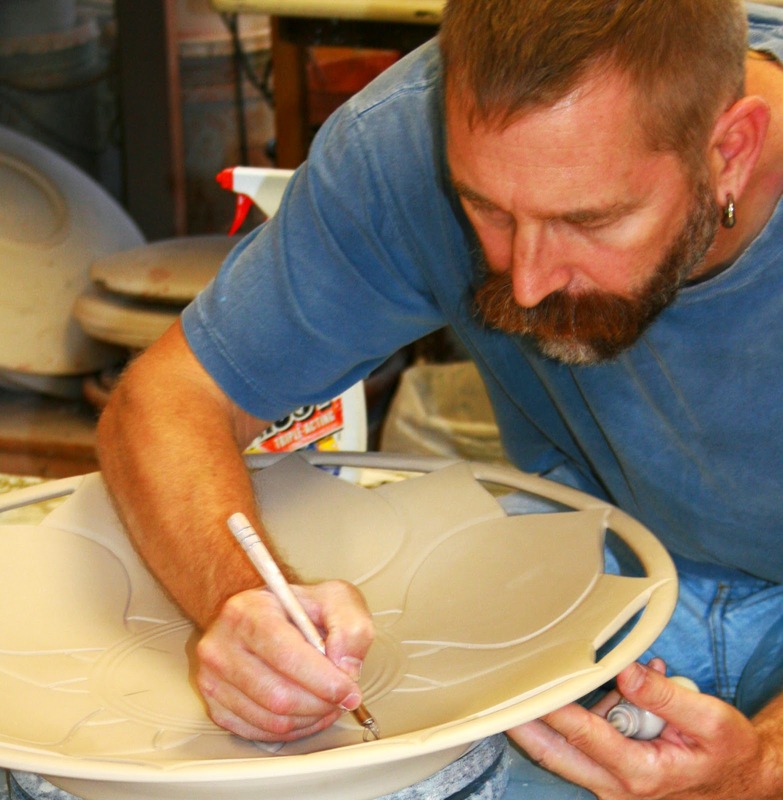 Not knowing how to turn his passion for clay into a business, Woods found himself working as first a graphic artist, later an art director, and eventually a television research analyst. He was very successful—but not very happy—at it. Meanwhile, Herbrand was learning the art of running a business. Herbrand, who grew up on a dairy farm, earned a degree in business from the University of Wisconsin then became a branch manager for a major grocery chain. It’s also hard work. Most weekends, Woods and Herbrand pack up their show tent, display racks and dividers, and crates of ceramics. Spring and summer, they travel from their Illinois studio to art festivals across the Midwest. Fall and winter, they work the art festivals in Florida and Georgia. The drives home become production meetings where they plan the coming week’s work. On Monday, Herbrand weighs out balls of clay, bags and marks them for Woods, then mixes glazes. They produce between 40 and 60 pieces of varying sizes each week. 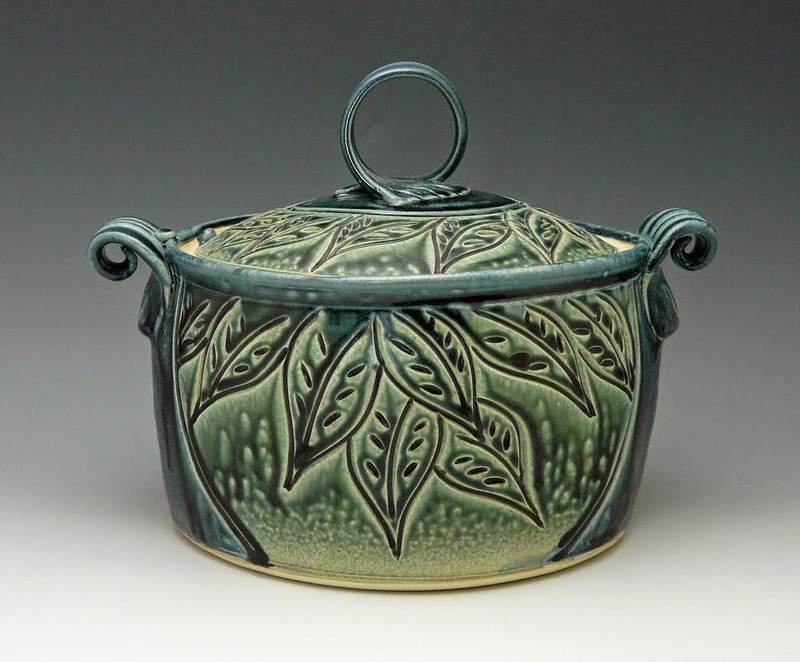 Woods also teaches at the Dunedin Fine Art Center, offers workshops through a local potters’ guild, and has written how-to articles for PotteryMaking Illustrated magazine. Woods said he gets a lot of satisfaction from helping others learn how to create their own work. “I guess I’m playing the part of my high school art teacher,” Woods said. Tour-goers following the south-to-north route will find The Pottery Boys’ studio listed as the first stop. Park in the large field next to their home and enter through the front door. Walk past the grand piano, through the kitchen—help yourself to refreshments—and out to the pool area for the kiln opening, which happens around 9 a.m. Or, linger in the living room area with guest ceramic artists Chuck Solberg, Teresa Testa, Cory McCrory, and William Kidd. This year’s media sponsor is radio station WMNF. The Pottery Boys also will be selling raffle tickets to support Suncoast Hospice.